Fours represent earth, matter, a solid foundation, plenty of room to accomplish a goal. They are energy filtering in from Heaven above, taking physical form on Earth below. From inspiration to manifestation, the four is formed. Swords are representative of Air, thought, intellect, logic, reason, communication. Steel resolve and cutting through nonsense. 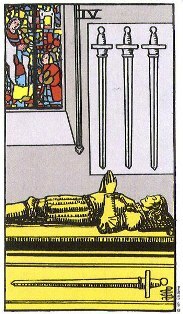 In this card, we see a man resting on a bed, one sword below him, longways – left to right, parallel with his body. Above him, pointing toward him, three additional swords. He is peaceful, with his hands held as if in prayer. The straight line that goes up and down is that of divine energy, the straight line that goes left to right represents physical matter. The swords in the position they’re shown on this card represent divine energy filtering through the sleeping quarrent, to manifest in physical form on earth. In the corner of this card is a stained glass window, a symbol of divine knowledge. The message of this card, when upright, is to recognize that the knowledge and wisdom of how to manifest desires comes while in sleep. In short, it advises to take no immediate action, but “sleep on it” and see how you feel about it after. Think it over. There’s a peacefulness to this card, a restful feeling. There’s no panic, no frustration, no fear, no trying to force things. He’s just resting, praying, waiting for the Divine Insights to reveal themselves to him. Reversed? Well… could indicate trouble sleeping, refusing the divine wisdom, or the NEED to do as the quarrent in this card does. The Swords cards all stand for trials of some kind, but the Four suggests feelings of peace and stillness. Why is this card different? Because it represents the challenge to be quiet! Sometimes resting and doing nothing is the ultimate challenge. Activity can be a habit that is very difficult to break. There is always so much to do, and modern society beguiles us with its attractions and distractions. The result is we forget to stop and be still. In readings, the Four of Swords is often a sign that you need to slow down and get some rest. If you are recovering from an illness, allow yourself quiet time to heal. Even if you feel completely healthy, you are risking getting sick if you don’t take a break. The Four of Swords also represents taking the time to think things over without hurry. It is important to step back and gain perspective. This is especially true when you are facing an ordeal or big event. You need quiet preparation time to gather your strength and center your energy. Picture an Olympic diver on the high board. She doesn’t climb the ladder and then dash out. She stops, motionless as she readies herself for the burst of activity to come. This is the only way to bring the best to our endeavors. Sometimes the Four of Swords implies that you are or could be shifting focus from the external to the internal. When we are silent, we can more easily go within. The knight in the picture appears to be praying or meditating deeply. Actually, he appears to be dead! For those who are addicted to activity, rest and quiet can seem like death, but that is certainly not the case. Stillness holds its own rewards, but they must be recognized and sought. Fours are ruled by the Emperor. Like both the Emperor and his throne they signify a kind of stability, a holding pattern if you will. For a moment, everything is still, solid, rooted, established. This can be positive, a solid foundation, or negative, something that refuses to budge or change. A young man rests on a pallet, three swords above, one under him. Though this card (in the Rider-Waite deck) makes the young man look dead, it is really only about taking a break. This is the “meditation” card. The card advises the Querent that they need to get away, rest, recuperate. Especially after the Three of Swords! The card indicates that the Querent has been facing mental or emotional stress, arguments, misunderstandings or verbal abuse, or that they’re ill or injured. A healing retreat is needed, time to clear the head, heart and soul, or just fix a damaged body. In this case, the stillness of the “4” is healing and positive. A quiet, unchanging scene is needed. The need for rest and relaxation; the need for a stress-free environment; time to take a vacation, preferably around nature; a welcome release or a change for the better. Rest, relief, retreat, convalescence. This is a period of retreat in which your mind seeks rest from the cares of the world. Conflicts have ended, worries are over; now you desire peace and quiet to gather your strength. You can now analyze your situation and logically decide how to proceed. You are able to put even the smallest details of your life into perspective and clearly see what has real value. Your solitude may be a convalescent period after an illness, a self-imposed vacation for rest and relaxation or an enforced retreat arising from social unrest. Whatever the impetus that propelled you to this space, it requires concentration and meditation on the experiences that have brought you here. If used wisely, this period can lead to a change for the better. The conclusions you arrive at subconsciously will affect your future actions. Tarot Symbolism: The figure has assumed the proper position for rest, inferring that rest from anxiety and strain has been earned. The swords are put away; three hang on the wall, and one is placed lenghwise along the couch. This shows that, if need be, action would still be taken to preserve peace. This is a card of peace and quiet, not death. The window depicts outer activity. A man is shown kneeling before a woman, symbolizing that the conscious mind (male) is still a slave to the subconscious (female). To the resting figure all is serene; the sword of discrimination has been used and put away. Astrological Correspondence: Third decan Libra. The mental side of Libra is strong in this decan; therefore, intellectual pursuits will attract you. You could do well in teaching, preaching, lecturing or writing. You have an amiable disposition and a refined manner, and you are extremely adaptable. You are logical and fair and believe in mercy and kindness. This is really the most balanced of the Libra decans. You have the integrity to be a judge. Your standards are high. Your greatest desire is for order, harmony, beauty and peace in your life.